The ABIM Internal Medicine board exam learning objectives may not expect you to know such detail but put your brain to work as you start your Thursday morning with the following dermatology question. What is the signature mutation associated with the below skin lesion? 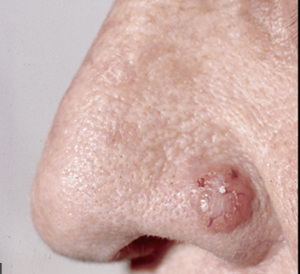 The above image shows a basal cell carcinoma (BCC), which is both the most common skin and overall cancer. Fortunately, it rarely metastasizes. The most common form of BCC is the nodular type, which features a “pearly” lesion with telangiectatic vessels. Sporadic basal cell carcinoma is associated with mutations in the Patched gene, which is found in the sonic hedgehog pathway, making Choice C the correct answer. This pathway promotes dorso-ventral patterning and growth. 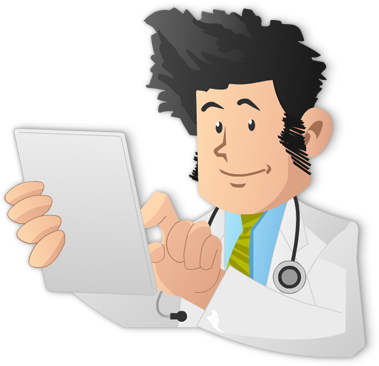 It is also implicated in the basal cell nevus syndrome, in which patients develops 100s of basal cells, palmar pits, and a variety of internal malignancies. Choice C (The sonic hedgehog/patched gene pathway) is the target of vismodegib, a patched analog that was approved in 2012 for the treatment of locally advanced and metastatic basal cell skin cancer. Choice A (P53 mutations) are associated with squamous cell carcinomas and their precursors, actinic keratoses. It is also associated with Li-Fraumeni syndrome, which consists of melanoma, pancreatic and breast cancers. Choice B (MLH1/MSH2 mutations) are found in Muir Torre syndrome, which is associated with keratoacanthomas, sebaceous adenomas, and colon cancer. Choice D (P16Ink4A) is associated with familial atypical moles and melanoma syndrome. Choice E (PTEN) is associated with Cowden’s syndrome, with trichilemmomas, breast cancer, and papillary thyroid cancer.